There's something very nostalgic about a caboose. I love to watch trains and miss those unique final cars. The caboose was a required for safety until the 1980s. It provided shelter for the crew, gave easy access to the rails for switching, and was a place for the conductor to complete travel records. With the advent of modern technology, companies convinced officials that cabooses were non-essential. Their elimination was mainly for cost savings. I've seen two old Burlington Northern Santa Fe cabooses here in Bellingham. The first was BNSF 10792 on September 10, 2011. It's been sitting on a side rail for quite some time. On July 24, 2012, I saw BNSF Caboose 12622 on a siding along Marine Drive just north of Downtown Bellingham. Online I've been able to research a bit of her history. She was built in 1969 for the Great Northern Railway as caboose GN X-142. After the merger in 1970 to create Burlington Northern, she became BN 10062, and with the creation Burlington Northern Santa Fe in 1996, she became BNSF 12622. Here's some of her rolling history. 1/1981 in St. Louis MO as BN 10062. 3/1972 in Auburn WA as BN 10062. 8/1996 in La Crosee WI looking fresh and clean. 9/2006 in Spokane WA with, only a little graffiti. 12/2007 in Tacoma WA with history info. 5/2008 in Tacoma WA with new paint. 6/2008 in Seattle WA still working. 11/2008 in Martin WA still working, more graffiti. 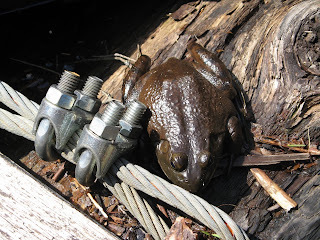 The Americans are coming -- American bullfrogs that is! Last week when I was at my float cabin on Powell Lake, I was greeted with the sound of bullfrogs singing in John's back bay. The shallow warm water is prime frog territory. Then while I was sunbathing on the deck next to my natural swimming pool, several huge tadpoles were swimming back and forth. But it's not all good. According to University of Victoria researchers, bullfrogs are not naturally found in British Columbia. They were introduced decades ago for frog farms (frog legs anyone?). Since then, bullfrogs have been expanding their territory by about five kilometres a year. Now that’s hopping fast! The main problem is that bullfrogs are voracious eaters, including indigenous frogs. Their decimation of native frog populations and habitats outweighs any usefulness. For its tenacity, the bullfrog has received the dubious “honour” of being nominated as one of the 100 "World's Worst" invaders by the Global Invasive Species Database (GISD). When I saw her sitting at the end of the dock in Steveston, BC, in the rosy glow of sunset, I knew she was a special ship. CA fv (Canadian fishing vessel) Canadian Shore looked ready to set out to sea to bring home a big catch. I just love the classic lines of a working boat. If you've a bit of change in your pocket, you can engage the Canadian Shore for the adventure or fishing trip of your dreams. Well, maybe a bit more than change. 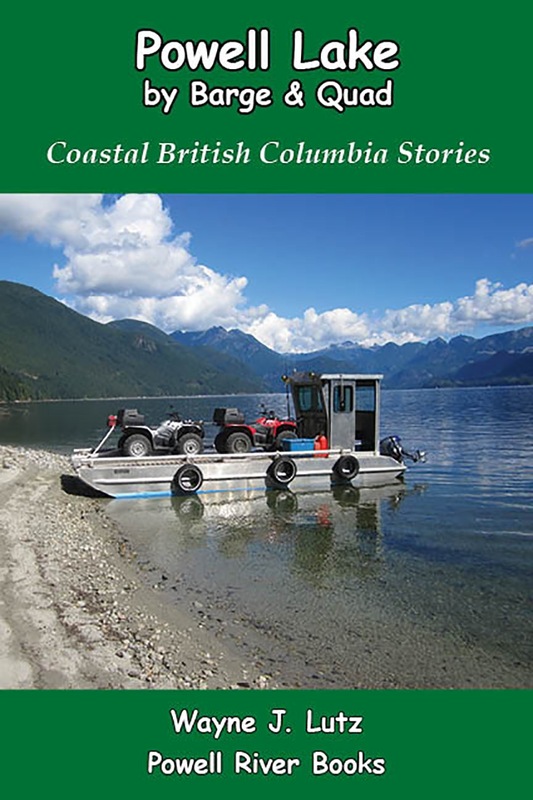 BC Adventure Tours offers custom overnight cruises starting at $3,000 plus the cost of crew, food and special requests. After reading Border Songs by Jim Lynch, Wayne wanted to get a Laser sailboat. In the book, Madeline raced a Laser and used it to surreptitiously cross Boundary Bay from Canada to the States. 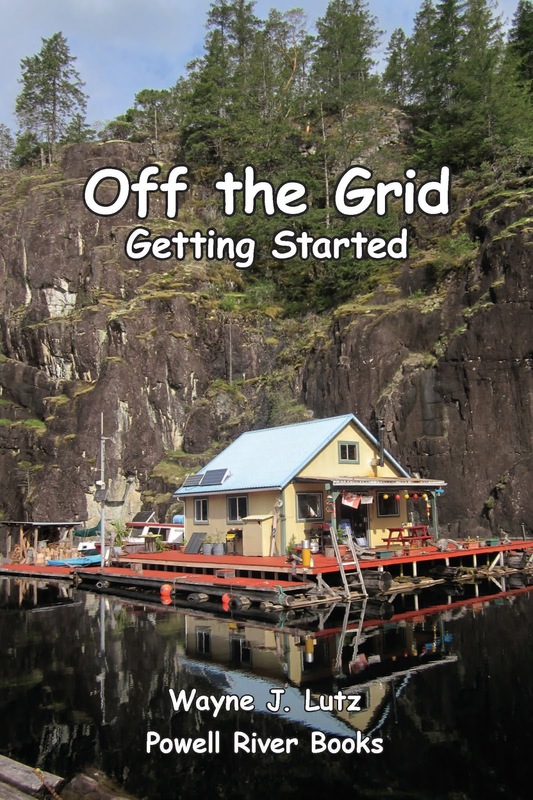 After an extensive search in Buy, Sell and Trade, Wayne found a used one on Vancouver Island. Unfortunately, it's taken until this summer for me to help as his "ground crew" so to speak. 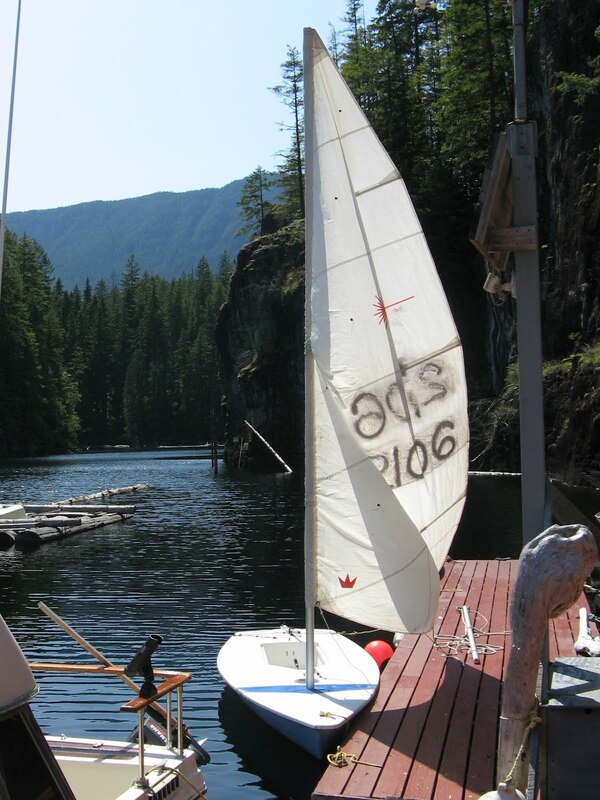 Laser Performance makes a variety of small sailboats, primarily used for racing. Maybe not the best boat for learning to sail, but maybe the most exciting. Wayne's spent a year reading about sailing and rigging his Laser. Finally, this summer he's been able to put all of his "book learning" into practice. There's something to be said about learning by doing, but learning to sail a boat this way might not be the easiest way to go. Here's how it turned out on the maiden voyage. The first day there was an exciting moment when the sailboat turned upside-down, the mast pointing straight down to the bottom of Hole in the Wall. I took the Campion out to help Wayne get it back upright. Just like riding a horse, he got back on and learned a lot from his experience. Maybe learning by doing is a good way after all. Yesterday I wrote about my yard of chard. Even with a small floating garden, I can easily produce more than the two of us can eat fresh. Our cabin is getting about eight hours of direct sunlight each day, so I thought I would try some sun dried chard using Mother Nature's solar power. 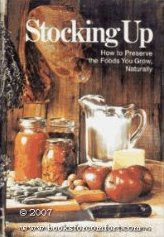 I consulted one of my preserving books Stocking Up: How to Preserve the Foods You Grow, Naturally by the Editors of Organic Gardening and Farming. I find it's a great reference for harvesting, storing, drying, freezing and canning fruits, vegetables, meats, dairy products, and nuts, seeds and grains. I've used the oven method before to dry chard, but this time I decided to modify their directions a bit. I picked prime leaves off the plants leaving part of the stems still attached. Rather than use drying racks, I thought stringing the leaves up like herbs would speed the drying process. I used a knife to slit the stems and inserted twine to hang the leaves. Since my chard leaves were nice and large with firm stems, this worked well. If they were smaller, I would choose a needle and thread. Stocking Up recommends blanching the chard for 30 seconds before drying. It helps preserve colour, nutrients and prepares the plant cells for the drying process. I chose to skip this step and hung the leaves directly in the open air. Thankfully, Wayne installed a line under the eaves of my new porch for my vegetable drying projects. On an especially sunny day, I took the strings of chard out front to get more warm sunlight. It was a bit breezy as well, so I think that helped things get started. Several times I separated the leaves because they tended to fold over and stick together. By the end of the second day, they were leathery but not completely dry. I had to leave for a few days, so I hung the strings of chard in a warm airy room in the cabin. Here they will finish the drying process. Once they are completely dry, I will remove the tough middle stem and store the leaves in canning jars with airtight screw lids. I know it isn't a lot, but I think it was a successful experiment. As long as Mother Nature continues to supply some warm sunshine and a crop of chard, I can keep adding to my supply for winter use in soups and stews. I planted two closely spaced three-foot rows of Swiss Chard from seed in March, and now it's ready to harvest. The stems can be cooked, but I use only the leaves. Swiss Chard is an excellent source of vitamins C, K, A and B, and minerals including calcium, potassium and iron. Another great thing chard, it's low in calories, about 7 for 1 cup raw. You can use chard much like spinach. I find it's a bit stronger in flavour, but goes well raw in salads or steamed. For dinner, I like to make creamed chard to go with steaks or roasts when Wayne cooks them on the barbecue. Melt two pats of butter in a frying pan. Add onion, pepper and herbs, and cook on low heat until soft. Stir in flour and cook for about two minutes, but don’t let it brown. Add milk and stir until it thickens. Add salt and pepper to taste (I like Lawry’s Lemon Pepper). If the sauce is too thick, just add a little milk. Add Swiss Chard and stir. It looks like a lot, but will cook down to make two nice sized servings. It’s so easy to make, I like to do it fresh each time. But if you like leftovers, you can increase the proportions and save some for another meal. It warms nicely with a little extra milk. Thank you to my friend Margaret (Thistle Garden) for introducing me to Swiss Chard. Now I know it's an excellent vegetable to grow in my garden for nearly year-round fresh side dishes. From our side of Hole in the Wall on Powell Lake, BC, the granite walls and tall trees block most sunsets. But this week we were across the bay at our friend John's cabin. On our way home, we took our tin boat out into First Narrows where we could look farther up the lake. The Jacob Haldi Bridge crosses Bedford Channel, a small arm of the mighty Fraser River. It connects Fort Langley, BC, on the mainland with McMillan Island. The bridge was named for Jacob Haldi who bought the former Hudson Bay Company store in 1902-03 and turned it into a butcher shop. I should feel bad. I ate this week's camera critter. I just couldn't help myself. I've been waiting a whole year for The Crab King floating restaurant in Steveston BC to open. It's a seasonal restaurant, and this is my first summer visit to this historic seaside village. Just like the name sounds, they specialize is fresh caught and cooked crab. So fresh, they are critters in a tank before they become tasty cuisine on your plate. My mini-vacation last weekend ended with a lovely sunset over the working harbour in Steveston, BC. I love walking on the docks and piers to look at all the tug and fishing boats. For boat watching, there's nothing like Garry Point Park in Steveston, BC. I've been there several times and it's always exciting. Whether it's motorboats or sailboats, pleasure boats or working boats, you'll see all kinds. The mouth of the mighty Fraser River is pretty boat friendly. Last weekend on my mini-vacation, I booked a room at the Historic Steveston Hotel (one of my favourite places). From there I could walk to the harbour, restaurants, shops, and of course, Garry Point Park. I saw the Fraser Titan several times moving in and out of the mouth of the river. She was hard to miss. The massive bridge could even be seen over the tip of Shady Island out in the main channel. And you could hear the massive diesel engines working hard against the current as she made her way upstream. Because she completed at least three trips while I was there, I guessed she might be working. The Fraser Titan is a 305' Hopper Dredge that belongs to Fraser River Pile and Drive (FRPD). Last weekend's mini-vacation had a Fraser River theme. 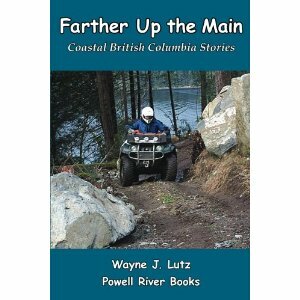 I started upriver in Fort Langley. This historic site was the location of a Hudson Bay Company fur trading post starting in 1827. 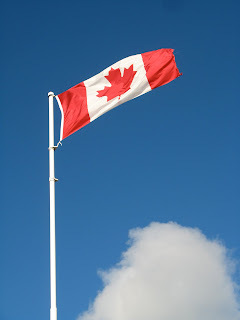 It was also where where British Columbia became a Crown Colony in 1858. Town is a combination of quaint old homes and shops, and new condos going up along the river. Parking was a challenge with lots of tourists, but I combined my visit with a stop at nearby Brae Island Regional Park. From there it's an easy walk across the bridge to town. Fort Langley is located on a branch of the Fraser River than runs between the mainland and McMillan Island. Along the shore are the Canadian National Railway tracks used by freight trains taking goods and materials from the coast to the interior. Lots of history here. I'll have to come back again to visit the Fort Langley National Historic Site and museums. 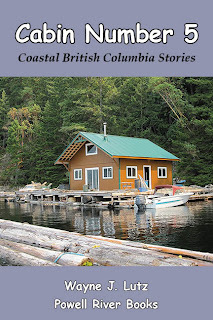 Powell River BC is about 130 kilometres north of Vancouver. We are on the mainland, but it takes two ferries to complete the drive north, and one if you are coming from snow capped Vancouver Island to the west. The Queen of Burnaby serves on the Comox (Little River) to Powell River run. She makes the crossing four times each day carrying locals and tourists alike. The last crossing is close to sunset in late spring to early fall. That makes for a very beautiful cruise. What an honour! Yesterday, Kirsten Dirksen of faircompanies.com, posted an amazing video of our Powell Lake float cabin on YouTube and her own Faircompanies website.